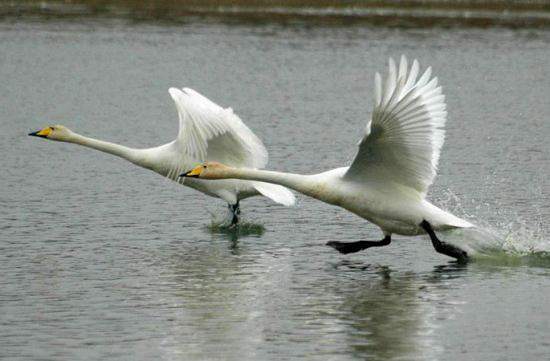 Water plants and to a lesser extent aquatic insects are the main food of these swans, which migrate many hundreds of km to their wintering sites in northern Europe and eastern Asia. They breed in Iceland and in subarctic Eurasia; the birds that winter in Britain (mainly in Scotland and northern England but latterly also in Norfolk) come down from Iceland. Whooper Swans arrive in Britain during October, bringing their cygnets with them, and normally (but depending on weather conditions) they make the return flight to Iceland in April. The Whooper Swan is also a winter visitor to many parts of Ireland. Those pictured above were photographed taking off from Tacumshin Lake, a large brackish coastal lake in County Wexford, Ireland. This picture was taken by Tom Pearman and is shown with his kind permission. The Whooper Swan has black legs and a long thin neck, which it usually holds erect. Because of its large size, this swan spends a lot of time in the water, where its legs do not have to carry the burden of its great weight. On land it is less cumbersome than the Mute Swan, and in arable farming areas Whoopers sometimes take a liking to cereal crops and even potatoes rather than eating mainly waterside plants; this does not endear them to farmers. Like other swans, Whoopers generally mate for life, and it is often possible to recognise returning pairs because the yellow patches on the bills vary between individuals and their shapes serve as 'fingerprint' evidence of identity. The only other swan with which a Whooper might be confused in Britain is Bewick's Swan, which is smaller and has proportionally less yellow and more black colouring on its bill. Being smaller, Bewick's Swans have faster wingbeats than either Whooper Swans or Mute Swans. The name Whooper is a reference to the call of this swan, which consists of a series of loud 'whoops' not unlike bugle calls. 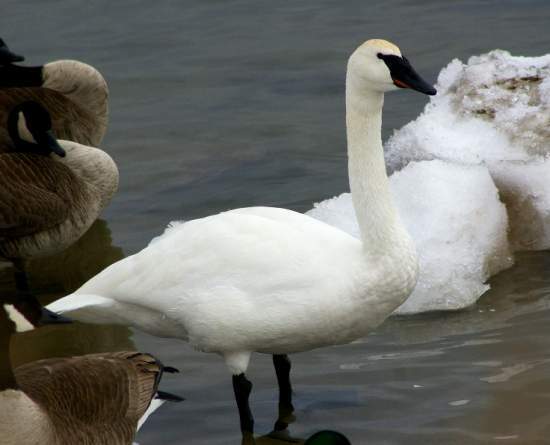 In North America a very similar swan with much the same kind of call is known as the Trumpeter Swan, Cygnus buccinator. It is a huge bird, and some males have a wingspan exceeding three metres. 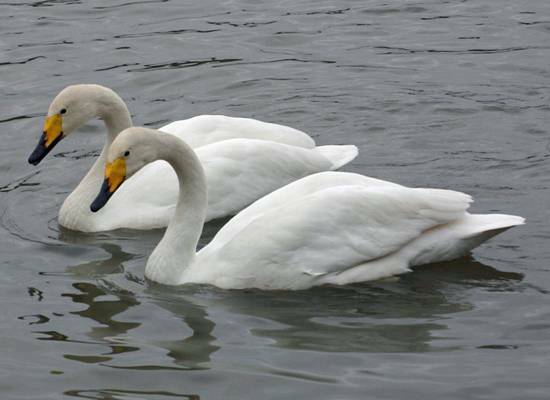 Some authorities consider the Trumpeter Swan and the Whooper Swan to be merely colour variants of one and the same species. This page includes pictures kindly contributed by Tom Pearman and Doug Holland.